(2011/SONY9 36 tracks 1963-72 w.10 page booklet. 15 Him Or Me -- What's It Gonna Be? "Paul Revere & The Raiders"
When Vietnam vets are asked to list songs they remember from the war years, two Creedence Clearwater Revival (CCR) songs frequently come up. One is Fortunate Son; the other Run Through The Jungle. Neither original version could be licensed for this Anthology yet both belong in it. The answer was to find alternates that were true to CCR's originals in sound and intent. 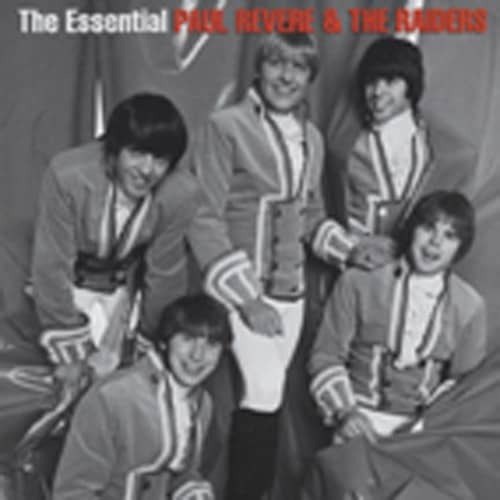 Paul Revere & The Raiders' CD 'Ride To The Wall,' specifically recorded for the men and women who served in the Vietnam War, provides those versions. Revere and his band had two dozen chart singles in the '60s and early '70s. Five made the Top 10 and one, Indian Reservation, spent a week at #1 and sold more than a million copies. In the '90s the group was popular on the oldies circuit, playing concerts at venues ranging from casinos to cruise ships. Typically the audience would include a number of Vietnam vets. When Revere added We Gotta Get Out Of This Place to the band's set list he got an unexpectedly strong response from the vets. The album 'Ride To The Wall' [the title song is heard on Disc 11] was born of that response. Listeners, both old and young, continue to differ on the meaning of Fortunate Son. They agree that it highlights the gap between the privileged—Senators' sons, millionaires' sons and others born with "silver spoon in hand"—and the blue-collar Americans who made up the bulk of combat forces in Vietnam. Most consider it anti-establishment and anti-war. There is far less agreement as to whether the last two qualities mean it's patriotic or unpatriotic. Commenting on the song's inclusion in Michael Moore's film 'Fahrenheit 9/11,' John Fogerty is said to have remarked, "To question your country's policy, especially in a war that kills people, is definitely not un-American. It's probably the most patriotic thing you can do." "If you're for peace then why don't you demonstrate against Hanoi?" The first nationwide Moratorium to End the War in Vietnam was a series of demonstrations held across the United States on October 15, 1969. In terms of participants—there were an estimated two million—it was by far the largest assembly of people who opposed the war. In Boston, 100,000 people listened to Senators George McGovern and Ted Kennedy. In New York City, Senator Eugene McCarthy, actresses Helen Hayes and Shirley MacLaine, and folksingers Peter, Paul & Mary, Judy Collins and Rod McKuen were among those who spoke to, sang for or mingled with thousands of war protesters. A second Moratorium day a month later attracted more than half a million people who marched on Washington. A point for debate is whether the demonstrations had any effect on the course of the war. Conventional wisdom has long held that political power is most often controlled from above, not below. When President Nixon was asked what impact the protests would have on him he replied, "Under no circumstances will I be affected whatever by it." Kundenbewertungen für "The Essential (2-CD) US"